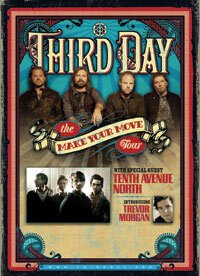 (NASHVILLE, Tenn) July 7, 2011 -- Four-time GRAMMY® Award-winning band Third Day will extend its massive “Make Your Move” tour into the fall by adding nearly 40 more tour dates across the U.S., once again featuring progressive pop Dove Award winners Tenth Avenue North and singer/songwriter Trevor Morgan as special guests. The “Make Your Move” tour officially kicks off Sept. 17, in Houston, and hits major markets like Atlanta, Tulsa, New York, Austin, Albuquerque and more, before wrapping up in Phoenix on Nov. 20. The fall leg of Third Day’s “Make Your Move” tour comes on the heels of the band’s successful spring run, which saw sell-out crowds at more than half of its 35 shows, setting the pace for an impressive year for the group Pollstar magazine hails as one of Christian music’s top touring bands. Music fans continue to be drawn to the band’s energetic live performances along with other interactive opportunities such as post-show “jams” and “photo booth meet-n-greets” made available to band’s loyal audience at select concert dates. The multi-platinum selling Third Day is currently touring in support of its 11th studio album, Move, which debuted last October inside the Top 10 on Billboard’s Top 200 Albums chart and at No. 1 on the Billboard Top Current Contemporary Christian chart. The Atlanta-based band will perform selections from the new album which have become concert highlights – including hit radio singles “Trust In Jesus” and “Lift Up Your Face,” along with “Make Your Move,” “Gone” and “Children of God” – as well as long-time Third Day fan favorites that feature the group’s signature rock sound. A special VIP package will be available for purchase, including a prime-seating concert ticket, an exclusive Third Day poster, a Move CD and entry to a special VIP Q&A with all the artists. A group ticket package will be offered, along with Fan Club pre-sale dates. The “Make Your Move” tour is sponsored in part by Grand Canyon University ( www.gcu.edu) and Christian humanitarian organization World Vision ( www.worldvision.org). World Vision provides assistance to approximately 100 million people in nearly 100 countries by tackling the causes of poverty and injustice. Over the past decade, the Atlanta-based, multi-Platinum rock band Third Day (made up of members Mac Powell, Tai Anderson, David Carr and Mark Lee) has racked up 27 No. 1 radio singles and sold more than 7 million albums which reflect an impressive 2 RIAA Platinum and 8 Gold Certifications. A recent Georgia Music Hall of Fame inductee (2009), Third Day has garnered 24 career GMA Dove Awards from 42 nominations, 4 GRAMMY Awards (with 11 career nominations), an American Music Award (with 3 American Music Award nominations) and multiple ASCAP honors for songwriting. As a credit to its songwriting, Third Day’s memorable “Call My Name,” off its Revelation project, was selected by country star Keith Urban as a bonus track on his Defying Gravity project. 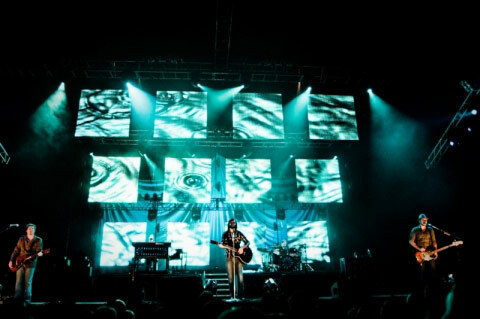 As a top-ranked touring band, according to Pollstar magazine, Third Day has played for audiences reaching into the millions. The band recently wrapped up the 2010 Make A Difference Tour, one of the year’s largest Christian concert tours, co-headlining with fellow artists Michael W. Smith, TobyMac and author Max Lucado. Because of its mass appeal, Third Day has been featured by top media outlets including “The Tonight Show with Jay Leno” (NBC), “The Late Late Show with Craig Ferguson” (CBS), “60 Minutes” (CBS), ABC’s “Nightline,” USA Today, the New York Times, and even graced the cover of Billboard magazine, which called Third Day “one of the best rock bands.” For additional information about Third Day please visit www.ThirdDay.com. Progressive pop band Tenth Avenue North – composed of members Mike Donehey (lead vocals/acoustic guitar), Jason Jamison (drummer), Jeff Owen (electric guitar/background vocals) and Ruben Juarez (bass) – saw its sophomore album, The Light Meets The Dark, debut in May 2010 at No. 1 on the Nielsen Christian SoundScan chart and No. 15 on the Billboard Top 200 with first week scans of 21,583. The album also secured the No.1 Christian Album chart position at both iTunes and AmazonMP3, and reached Top 5 on the iTunes overall chart. Named GMA Dove Awards New Artist of the Year at the 40th Annual GMA Dove Awards, Tenth Avenue North first impacted the music community as the best-selling and most played new Christian artist of 2008, scoring three No. 1s at radio (“By Your Side” finished the year at No. 2 on the Hot Christian Songs chart, and at No. 3 overall for the decade on said chart) and saw its national debut Over and Underneath (5/20/08) cross the 100,000 unit sales mark in less than seven months. To date, Over and Underneath has surpassed the 300,000 mark in total album sales. The breakthrough band received two nominations for the 41st Annual GMA Dove Awards in the Group of the Year and Song of the Year categories and the smash hit “By Your Side” claimed the coveted Song of the Year honor. Tenth Avenue North continued the momentum gained from its first headlining tour in 2009 (executed with only one album under its belt) with feature slots on the 2009-10 Winter Jam and Casting Crowns tours, plus a very active summer 2010 festival schedule. This fall, the band undertook its second headlining tour – The Light Meets The Dark Tour – which saw Tenth Avenue North play to more than 67,000 fans and sell out more than half its hard ticket dates, along with generating sponsorships for 1,700 children within Compassion International programs. For more, visit www.tenthavenuenorth.com. Trevor Morgan is a Dove Award-winning singer and songwriter based in Franklin, Tennessee. His guitar prowess has made him an in-demand session player in Nashville, and his electrifying live performances have left crowds buzzing across the country. He has recently been involved in the Glory Revealed albums and tours, and his new Mac Powell-produced solo project will be available this spring through Third Day's Consuming Fire record label. For more information, please visit www.facebook.com/trevmorganmusic. For the most up-to-date tour information, please visit www.ThirdDay.com. For more info on Third Day, visit the JFH Artists Database.